Dwelling in the Fuchun Mountains is a legendary shanshui (landscape) painting created by the Yuan dynasty painter, Huang Gongwang. This handscroll, which is over 22 feet long, has a fascinating history. There are many stories associated with it—there are even stories about the inscriptions that have been added to the scroll over the years. As the story goes, the handscroll escaped destruction because a nephew disobeyed his uncle’s dying wish. In the late Ming dynasty, a collector named Wu Hongyu was so fond of this handscroll that he put it next to him while sleeping and eating, even carrying it when he fled in bare feet during the Manchu conquest. On his deathbed in 1650, Wu instructed his nephew to burn the handscroll so that it could accompany him into the afterlife. The handscroll started to burn. Fortunately, Wu’s quick-thinking nephew saved it by substituting another painting, unbeknownst to the near-death Wu. This burning of the handscroll resulted in it being separated into two parts as it appears today. The first part, “The Remaining Mountain” is now in the Zhejiang Provincial Museum in Hangzhou while the latter part known as “The Master Wuyong Scroll” is in the National Palace Museum in Taipei where it has the status of a national treasure. The lengths of these scrolls vary greatly, the first part is 51.4 centimeters (a little more than 20 inches) and the latter is 636.9 centimeters (nearly 21 feet). What is a Chinese handscroll painting? Imagine you are hiking in a national park with a video camera. You film your progress on the hike with a range of camera shots: wide shots, medium shots, close ups, and so on. Appreciating a handscroll painting is similar to this visual journey. Due to their horizontal format, you cannot view the entire handscroll all at once. Although museums often display handscrolls completely unrolled, from beginning to end, this is not the way artists intended for them to be experienced. Rather, they can be described as a slowly evolving journey of discovery that unfolds with intimate physical movement. To view a handscroll one must begin by holding it in your hands. The handscroll is held by your left hand while the opening end of the handscroll is held by the right. The scroll is unrolled towards the left, shoulder width and at arms length so that the first section can be viewed. The right hand then rolls the start of the scroll to the left to re-roll the viewed section. The left hand then unrolls further towards the left until the new section is revealed for viewing. The right hand again re-rolls the viewed section. Section after section the process is repeated until the entire scroll is viewed. The process is then reversed to re-roll the entire scroll so that the first section is in correct position for the next viewing. 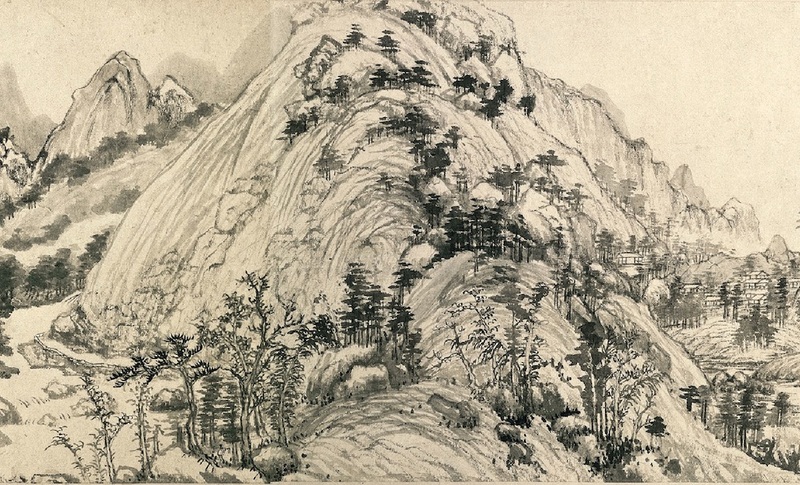 Dwelling in the Fuchun Mountains is a landscape painting. The journey starts with a robust mountain viewed from a high angle, looking at the lush vegetation and rocks. This is in “the Remaining Mountain” section of the scroll, which is the shorter of the two sections (image above). We now move to “The Master Wuyong Scroll,” in which you experience the scenery of lower slopes (image above). There are different forms of trees in the lower half of the composition with lots of empty space. Gradually, after the vast initial view, your eye rises as if you are ascending to a point from which you can see farther to the distant mountains (image above). There is a spectacular panorama in front of you. There are rounded mountains with lush trees and grass, houses and paths in the valleys. Further on, we see a figure fishing in a boat, and to the left, under the shade of some trees in the foreground, we see pavilions beside water (image below). 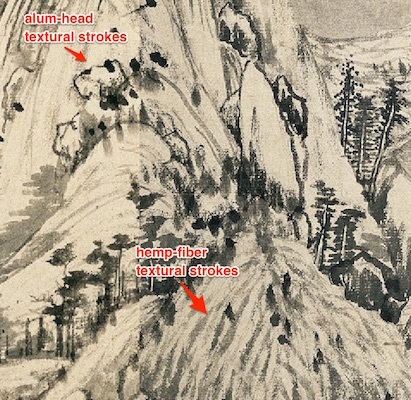 Descending to a lower altitude, there is a nearby shore rendered in dry brushstrokes (on the far right) and groups of trees characterized by wet horizontal dots with great variations of ink tones (image below). Approaching the end of the scroll, a majestic peak echoes the robust mountain that we saw at the very beginning of the scroll. In an elegant finale, the journey ends with low-lying mountains rendered in pale ink washes that taper into blank space (image below). The format of the handscroll allows for multiple perspectives in the same painting, embracing the landscape’s breadth and depth along the river and mountains as a continuous journey progressing through time and space. While landscape is a subject of both Chinese and Western art, they differ in their respective approaches. A Chinese landscape is not a visual record of a particular day or a single view, but rather it captures the flow of traveling through changes in atmosphere and multiple perspectives. According to Huang’s own inscription on the handscroll, it took him three to four years to finish the painting. It was not consciously constructed, but executed in a spontaneous state. Huang added to the painting when the mood was right, using six sections of paper to create “The Master Wuyong Scroll.” Huang did not paint for the court or the art market, but painted for himself as form of leisure and self-expression. Huang came from a poor family. His original surname was Lu. When he was around eight years old, he encountered Huang Le who was in his nineties and had always wanted to have a son. Following the custom of the day, Lu was adopted and changed his surname to Huang. After much study Huang became an official-scholar, but he later was embroiled in a dispute and imprisoned. After his imprisonment, he abandoned the thought of reaching a higher official rank and returned to his hometown in Changshu, Jiangsu province, where he lived as Daoist and traveled to nearby sites. In 1347, in his late seventies, Huang travelled to the Fuchun region accompanied by his Daoist friend, Zheng Wuyong. He began painting this handscroll at that time, and finally finished it in his eighties. What is Daoism? Huang was a Han, an ethnic group of China. He also belonged to the social class of literati. The literati were educated elites who were interested in painting, calligraphy and poetry. Many literati in the Yuan dynasty, a dynasty founded by the Mongolians, were Han Chinese like Huang. They did not serve the non-Han court and lived a reclusive life. Painting to them was a kind of self-cultivation. Their intended audience was not the general public, but their circles of friends. Their paintings often emphasized the expression of the painters’ temperaments rather than visual resemblance to forms. The handscroll was executed with brush and ink on paper. The use of brush and ink was thought to denote the artist’s spirit and temperament. The Dwelling in the Fuchun Mountains handscroll is a visual feast of methods and techniques, with bold tones and subtle shades, wet and dry brushwork, sparse and dense applications of ink, as well as the twists and turns of calligraphic lines. Huang paid respect to earlier masters by appropriating the textural strokes they developed. For example, Huang used hemp-fiber textural strokes and alum-head textural strokes associated with the painters Dong Yuan and Juran (both of whom lived in the 10th century). The term “Alum head” is also used to describe the form of the boulders more generally. “Hemp-fiber” strokes refer to layers of long and thin strokes from the top to bottom of the mountain, while “alum-head” strokes shape the angular, small rocks on the top of the hills. While respecting tradition and past masters, Huang’s handscroll created a dynamic composition and achieved a vitality that surpassed previous painters. Huang’s influence on later generations of literati painters was enormous. In the wider context of Chinese art history, his work is considered a national treasure. Cite this page as: Hung Sheng, "Huang Gongwang, Dwelling in the Fuchun Mountains," in Smarthistory, November 28, 2015, accessed April 23, 2019, https://smarthistory.org/huang-gongwang-dwelling-in-the-fuchun-mountains/.